I feel like blogging has fallen into the capitalist mode of production: quantity over quality. Keywords and numbers of reasons why someone should do something* are systematically slapped together, materials of which were ripped off another blogger's stolen work. Titles manipulated to disguise the lack of words, only aimed at growing pageviews and followers, rather than readers. Can't say that I hadn't tried it out myself once or twice, just as everyone wants to play in capitalists' game of fast-fashion--hey, we all love immediate albeit temporary satisfaction for little cost--fast-blogging seemed a guarantee to a quick fix on feeling successful. A couple silly posts hit record pageviews but left me with few reader relationships and fewer time on my own hands left to work on projects that inspired me. I invest (quite a bit of) time (whatever little I have as a university student aka expert procrastinator) into every blog post, and after an academic quarter/2.5 months of committing to blogging every other day (& failing, of course--as a Persian, time-commitments and deadlines don't compute) and making JooJoo Azad my part-time job, I realized that the biggest thing holding me back from executing all of the exciting projects I had dreamt up (& truly growing my blog) was, in fact, making sure that my blog was on schedule. Which is kind of silly, if you really think about it. Simply put, the JooJoo Azad (for those of you new to the show this means "Free Bird" in Farsi, and, contrary to popular belief, is not my name) had caged itself. Now that I'm really committed to a number of major projects and collaborations, I don't think committing to posts every other day would be sustainable (for either of us). In the words of one of my favorite bloggers, Jen of JennyPurr, "Make yourself smaller so you can make yourself bigger." And I think it is only after 2.5 months of making this mistake that I've really learned what that means. Not to mention this means less burnout and writers block. So, I'm committing to two posts every week, with each post being something worth your (and my) time. Deal? If you're interested in slow blogging & want to learn more be sure to check out Jen's Slow Blogging for Creatives and the Slow Blog Manifesto. *Okay maybe I was a bit too harsh. Numbers in titles seems like a current blogging fad but I'm kind of a fan. My life is organized into lists. TL;DR: Fast blogging is like capitalism. I am not a capitalist and therefore I will no longer embrace it. What I will embrace though, are quality posts and thinking ahead/sustainably. Also, apparently I understand everything through politics. I honestly would love to hear from you. Are you a fan? Have you thought about slow-blogging? P.S. Keep the questions on Islam coming--they are all so interesting so far! P.S. I'll be in Germany in two days(!!!!). Come along! When I started blogging never in a million years I thought I will have devoted readers or the number growing. I started with no expectation and write what I enjoy so far I been bless 2 years in blogging world still have the same readers from the begining and encounter new ones everyday. So is all about if the reader enjoy what you write so doll enjoy what you write if it show your personality that is what counts slow or fast. I love this idea, and as a 'blogger' myself (trying to work it out, I'm at uni too) I even find it hard to post twice a week. But it's always a good point to start at. I've always thought that 'the bigger is better' is more like 'the bigger the sillier', they put a lot of stuff up but it doesn't move you, it's always the same. I'd rather read blogs based on the 'lesser but better'. Lots of luck and go for it girl!! I'm with you, Hoda. Having only started my own blog two months ago, I craved for pageviews and followers -- it's only natural, so I posted as much as I could and left thoughtless comments on people's blog for the views and the followers. The views increased gradually and I felt a kind of satisfaction. The comments, however, that were returned on my blog were just as thoughtless as mine and I soon realized it felt terrible to have someone come to your blog, not read what you write (because I did devote a certain amount of effort into my filler posts back then) and just so they can promote. It's the slow blogging I've recently started adapting to that's been lifting my spirits and keeping me happy as someone who enjoys writing posts worth reading. Anyway, good luck with your new schedule. You can be sure I'll be back every week to read whatever you've written! I (me as a blogger) personally think that we do not need a schedule, because first of all we blog for ourselves and then to others. We can not please everybody and even if we can and do that we lose ourselves in the process. I think most of people start blogging not to get the hits and fame but to express himself/herself or his/hers doings. It's kind of like your own personal diary what people can read, comment and give you some feedback. Also I think people should give more feedback, even if it's bad (insults `does not count as a feedback). Only then we can improve. I love this post so much and found myself nodding in agreement. Why have a short post when you can take the time to write something thoughtful that means something more than just a description of your outfit? I usually post once a week or week and a half, and I like to try to bring something funny or some sort of story to the table. Otherwise I would feel so rushed just posting a mere outfit picture and saying "this is what I wore today HOPE YALL ARE HAVING A GOOD WEEK LOL CYA BYE!" But yeah, I feel like posting less frequently allows me to post longer replies to comments as well as getting to know a specific few people. In addition the comments are usually more thoughtful and longer than a "cute shoes xoxo" sort of deal. Like I'm doing here! And if other people post less, too, I'm more likely to leave longer comments on their posts as well. Any who, dang great post. Makes me feel better about posting at a slower frequency then some. Yes, yes, yes! 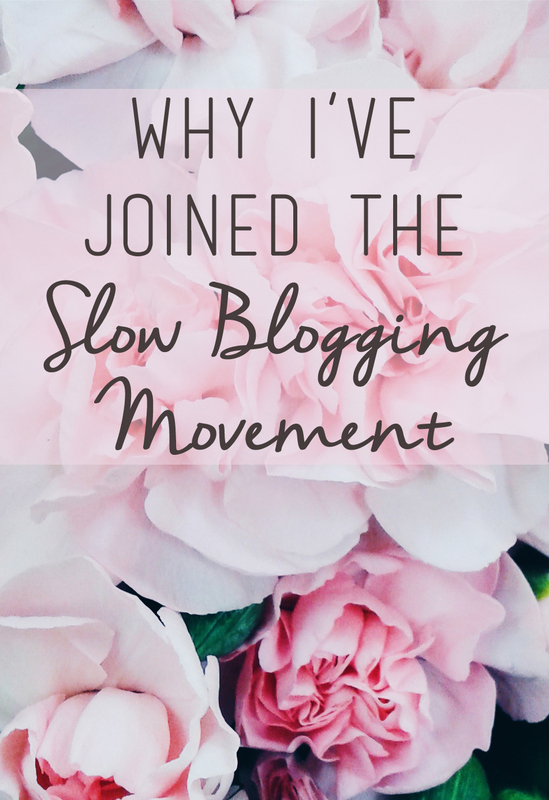 I (unknowingly) joined the Slow Blog Movement last Christmas when I really hit a wall. I had writers block, couldn't take outfit photos because I was at work in the only daylight available (and shooting multiple outfits in the cold was not an option), and felt like most of my posts were half-assed. I don't want to be a half-assed person! I want to be whole. That's why I cut down to twice a week. And sometimes, even then I have nothing to say. I'd rather say nothing in no time than spend a couple hours writing a whole bunch of nothing. Lists are cool though because my life is so organized it's just sick. But I. Can't. Stop. Yes, I only recently started blogging as a way to introduce myself into the world of social media, and also to challenge and put myself out there. Since I work and go to school full time I was already limited on the time I could dedicate anyway to blogging. I won't lie, in the beginning the idea of making money off of it did scream at me and I felt this unwavering pressure to increase supply to increase demand. That screaming has dialed down to a whisper, and I have managed to resist the urge to create more "just because" and only put out posts I am proud of or at least felt inspired to write. By the way I have been loving your posts, and love that you are dialing it back. I have to say from a reader's perspective "less seems like more", as I hate being bombarded with a ton of posts. Its a lot to read through. I am always committed to creating when I am inspired to everyone time and not waste it. I blog maximum twice a week and it is the best decision ever! This is definitely resonating with me at the moment!! Not that I've ever fallen into the trap of producing "fluff" just to hit a weekly goal of posts, but definitely feeling anxiety if I'm not measuring up to those goals if a post is taking longer to produce than I expect. It's SO limiting!!! I like the idea of quality over quantity....I'd much rather follow a blog that posts amazing content 1x a week than a blog that speaks empty words and posts stock photos like 3x a day. It's so weird how bloggers lose sight of that, they're always just "MORE MORE MORE." Kind of what kills blogging in my opinion. I like this slow blogging movement!!!! Your blog grows so much in just 2.5 months! I feel the same way how posting on time can have poor quality. I want to spend more time and put more thoughts into my posts. Maybe I should slow down my posting pace and do more research! Hi, your post came through the bloglovin' feed as one of the "most popular" and I was intrigued by the title! You know, if one to two posts a week is slow blogging, then I think I probably have always been a relatively slow blogger! I long ago made the proclamation that I try to live with -- I own the blog; it doesn't own me. I tend to do about two posts a week, but sometimes life is fun and exciting and I do more; other times I'm traveling or busy and offline and can barely get out one. And I have to be OK with that. Sometimes I'm late replying to comments personally, which I try to do when someone replies with an email address attached. My blog goal was two-fold. To build relationships with others around the world and to have a platform where I can share things that are meaningful to me. If others are interested they will find me and they may stay a bit -- or not. And that's OK. I think I've met both of those goals. I'm not interested in monetizing right now (though at some point I may do an online boutique/gallery as part of the blog. In my world, quality reigns over quantity. Sometimes it spills out. Sometimes not. I can work with that! Nice meeting you, Hoda, and I hope your new plans work well for you. I do agree with you and scheduling posts are crucial because I feel there is no organisation, then you end up putting ideas. There definitely needs to be some plan of action, every month! I enjoyed the read, interesting post! Interesting post. Never come across my mind about this term called slow blogging till now *_^ I do have to agree with Jackie Harrison here about putting your passion in writing and if the reader enjoys what you write, I guess fast or slow it all depends on the individual blogger. I also agree with May Cho here when she says we are all guilty of leaving comments on other bloggers' blog hoping to get back comments or readers in return. But I guess all it boils down to is sincerity and honesty in blogging or even leaving comments. Seriously, I have SO many favorite blogs that I hardly have time to read them all. But I have adopted the motto for this year to just go with the flow... as much as I would like to engage in other blogger's blog and comment in return to "gain" more traffic to my blog, I feel a woman can only do this much, given the time that one has in a day *_^ We all can only try the best we can. I do realize you understand and make sense of your world through politics. I guess that's what makes you special as a blogger and that is what interest me about you the most to begin with! Be it fast or slow, take your time and enjoy. I wouldn't like to be stressed out just because I have so much blog posts to catch up (which I serious do have now, haha and am feeling the pinch), but I told myself, hey, blogging is supposed to be fun and enjoyable. If not, why blog? Great post! Have always loved your take on things. Have a beautiful trip and shall catch up over at IG then! I feel you, Hoda. Definitely struggling with my posting schedule still....I find that when I post every day I get more viewers and more feedback. But if I am posting on things that aren't very interesting or thought out, that interest all falls back. Right now I'm thinking about testing a schedule of 1 filler post per week, 1 regularly scheduled post, and ideally, 2 interesting topics! Still sounds like a lot. But I'll be taking it slowly ;) I hope slow blogging works for you, lady! I'm interested to see what you will have now in the blogging category. So much of your posts have been about optimizing the capitalist side of things! You have always done diligent writing that shows me new things, and I'm looking forward to the new ones doing the same. This is a great post. For a while I was disillusioned by the whole capitalist direction that blogging appears to be taking. I even tried to imitate it, but I found myself so unhappy with what I was posting. When it comes down to it, blogging has always been a personal thing for me and this year I've been able to remind myself of that. Now every post I write I feel proud of because I only write about things I love and am passionate about. I do the odd collaboration but even then, I make sure that what I am writing is something I believe in. It may not attract a lot of 'followers', but blogging grants me so much clarity. I don't know what I would do without it. I shall be joining you in the slow blogging movement :) I'm excited to know such a thing exists. I've just come across your blog and this is so great! I'm a newbie blogger and am quickly realizing what is and isn't feasible...! Great post!